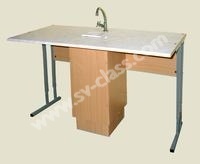 See this product in interior Laboratory table for a physics classroom is intended for the equipment of two pupil's workplaces at physics classrooms. 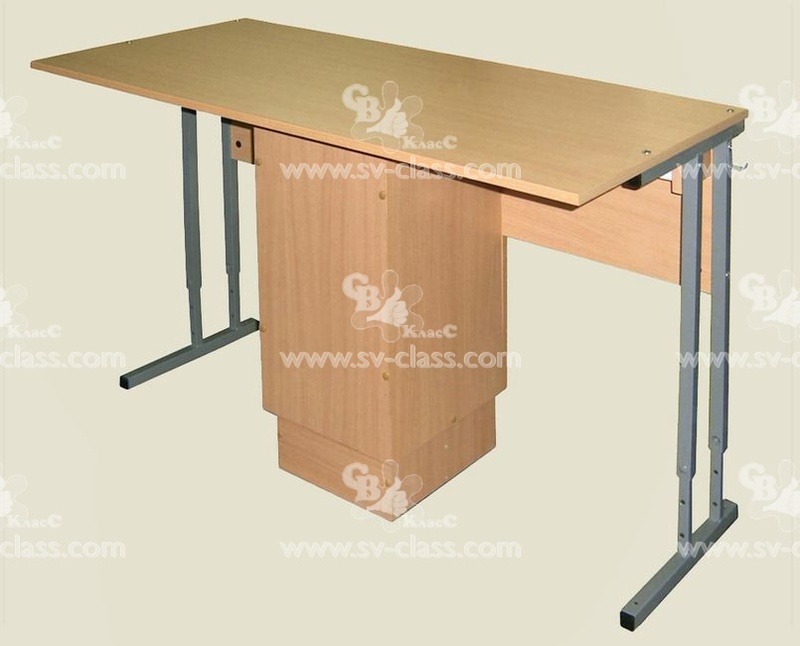 It is two-seater table with the rectangular top, based on two metal racks and support pedestal. The table has design with adjustable height. The pedestal consists of a base and a socle support which are fastened to each other at any of three levels. Inside the pedestal there is space for electric wiring. 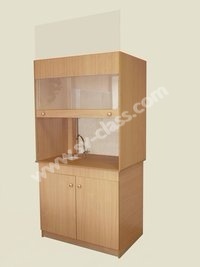 For convenience of its installation the pedestal front vertical board is demountable. Sockets mounts on the front vertical board or on the left and right sides of the support pedestal. Material of the wooden part: laminated chipboard (the color – beech), PVC edging. Material of the metal racks: metal pipe of square cross-section 25*25 mm and 20*20 mm (in the places of adjustment) with polymeric covering of grey color. Sizes (W*D): 1200*600 mm, the height is adjusted according to 4-6 groups of height. 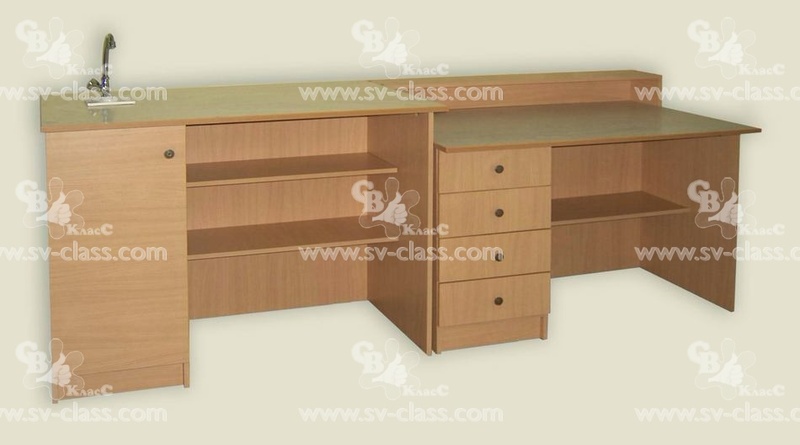 See this product in interior Laboratory table for a chemistry classroom is intended for the equipment of two pupil's workplaces at chemistry classrooms. 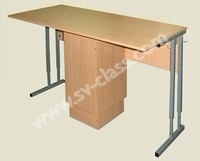 It is two-seater table with the rectangular top, based on two metal racks and support pedestal. The table has design with adjustable height. On the top there is a sink and a tap for mounting cold water. The pedestal consists a base and a socle support which are fastened to each other at any of three levels. Inside the pedestal there is place for electric wiring and plumbing. For convenience of their installation the pedestal front vertical board is demountable. Sockets mounts on the front vertical board or on the left and right sides of the support pedestal. Material of the top: postforming – shipboard, coated with plastic (the color – beech), 2 mm PVC edging. Material of the front board and the support pedestal: laminated chipboard (the color – beech), PVC edging. 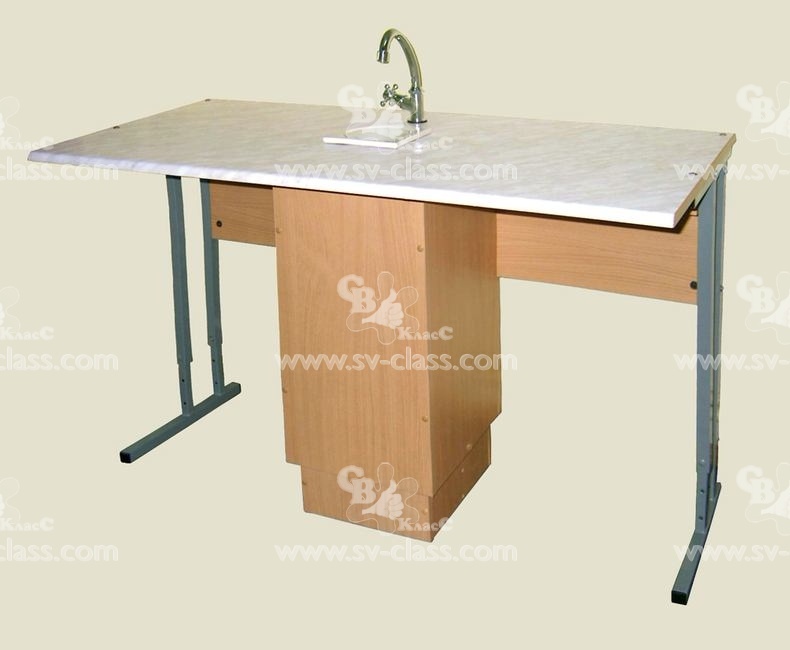 See this product in interior The Demonstration table for the physics classroom is intended for the equipment of the physics teacher's workplace and for demonstrating physical experiments. 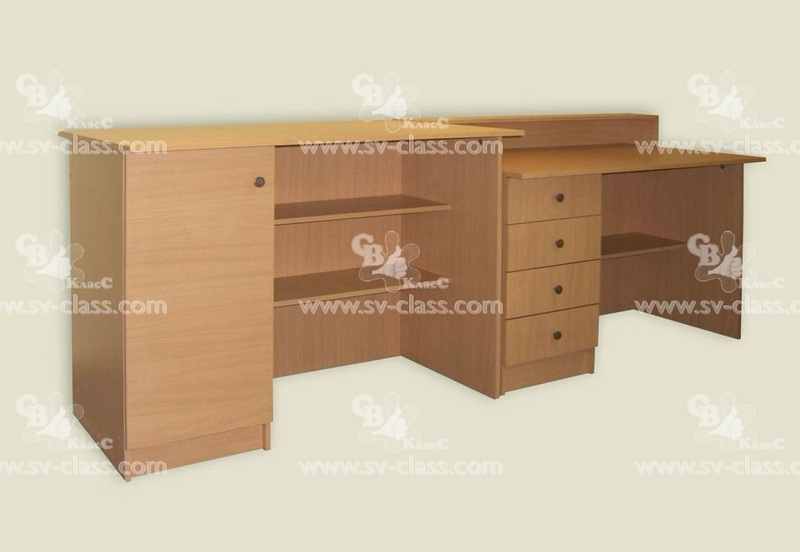 The table consists of two separate tables with pedestals. Inside the pedestal of the left table, behind the door, there is an insertable shelve, in the right table there are four drawers and the niche above them. On the right table the pedestal shelf is placed. Sockets mounts in any place, convenient for user. See this product in interior Demonstration table for a chemistry classroom is intended for the equipment of the chemistry teacher's workplace and for demonstrating chemical experiments. The table consists of two separate tables with pedestals. Inside the pedestal of the left table behind the door there is place for plumbing, in the right table there are four drawers and the niche above them. On the right table the pedestal shelf is placed. On the top of the left table there is a sink and a tap for mounting cold water. Sockets mounts in any place, convenient for user. Material of the tops: postforming – shipboard, coated with plastic (the color – beech), 2 mm PVC edging. See this product in interior Fume cupboard is intended for the work, accompanied by allocation of toxic gases. The cupboard consists of two parts. The lower part has the top coated with plastic, with two sections behind the doors. The first section is intended for the arrangement of plumbing; the second section has one insertable shelf. On the top there is a sink and a tap for mounting cold water. The upper part of the cupboard has the handling chamber. In front there is an elevating glazed door, that rises by means of counterbalances, fixed on the back wall of the cupboard. The back fixed wall is glazed for the convenience of viewing the experiments.